If the player above doesn't work for you, try this direct download link. For over forty years, Douglas Gibson worked with the best and brightest in Canadian letters, helping to create from the ground up the collective work we proudly label CanLit. As editor and publisher, working for Doubleday, Macmillan, publishing his own imprint, Douglas Gibson Books, and finally taking the top job at McClelland & Stewart. Gibson has worked directly with three Prime Ministers on their memoirs, convinced Alice Munro that short fiction might just be her thing, and braved the ire of the formidable Mavis Gallant. 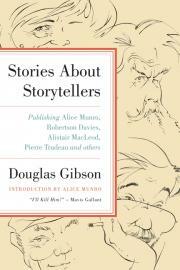 Gibson's 2011 memoir, Stories About Storytellers (ECW Press), collects his reminiscences about the many fascinating, intimidating and brilliant writers who passed through his office. Over the course of his career, Gibson traveled across his adopted country, seeing more of Canada than most of us who were born here ever will. These days, Gibson spends much of his time traveling the country again - this time to present a stage show based on the stories in this book. The book is well enough known, having received excellent reviews in the Canadian media, and some of the stories in it have already become legends. My hope for this interview was to get behind the stories a bit, and find out more about Doug Gibson himself. Doug Gibson joined me in the board room of The Writers' Union of Canada and the Writers' Trust of Canada, two organizations that have been around in the world of Canadian books not quite as long as Gibson himself. We spent a delightful couple of hours chatting, and I've carved that recording down to a solid hour. I hope you enjoy the podcast. I certainly enjoyed producing it.